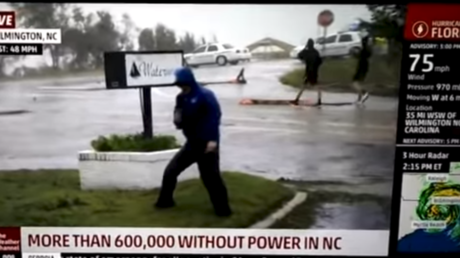 A video of Weather Channel’s Mike Bettes battling wind gusts in the eye of hurricane Florence has gone viral for all the wrong reasons, after two men casually walking by in the background were spotted on live broadcast. During a live Weather Channel broadcast from Wilmington, North Carolina, Bettes is seemingly holding for his life. He has been ridiculed online, though, after an attentive viewer spotted two locals walking by in the background as if nothing special was going on. The men, dressed in hoodies, can be seen taking snaps with their phones while Bettes is struggling to stand on his feet. The video has taken Twitter by storm, getting shared over 35,000 times with users accusing the 24-hour channel for hyping up the already tragic cause for the sake of ratings. The Weather Channel was immediately branded “fake news,” with some users wondering whether it was acquired by CNN, a prime target of US President Donald Trump’s criticism of the mainstream media. Some called on the weathercaster to issue a public apology, while others suggested the ‘performance’ by Bettes who seems to be deliberately standing in the wind, deserves an Oscar. “Acting like they’re leaning into the wind with two people walking easily behind them. Is this not exactly what @realDonaldTrump has been talking about?” one user tweeted. The weather channel caught faking the intensity of the storm. Acting like they’re leaning into the wind with two people walking easily behind them. Is this not exactly what @realDonaldTrump has been talking about? Bettes in known for being a star of several dramatic videos, where he puts himself directly into harm’s way despite serious risks of being hit by debris or blown away by wind. While he did seem overly dramatic in Friday’s newscast, Hurricane Florence is no joking matter. Looming as a Category 5 earlier this week, it has since been downgraded to a tropical storm. Florence made landfall Friday morning northeast of Wilmington, North Carolina, tearing off roofs with winds of over 70mph. The storm has killed at least five people so far, including a mother and a 8-month old child who died after a tree crashed on their home in Wilmington. One of the casualties, a 77-year-old man, died after reportedly being blown away by the howling winds. The National Weather Service is predicting “catastrophic flash flooding” along the coastline of the Carolinas.